RSS feeds. You can subscribe to feeds of all reviews near you. If you find a reviewer you like, you can stay up-to-date on his or her reviews. 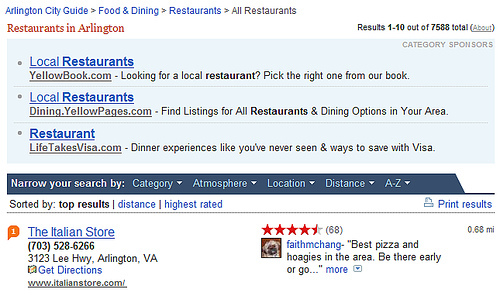 A “first reviewed by” designation to highlight contributors who are the first to review a place. Yelp has had the first two features for at least a year. Among the local players, Yelp has had the best incentive system for contributors. Its “First to Review” designation is one of many things that Yelp does to encourage frequent participation. An “Elite” system rewards frequent contributors with a badge on their profile and invitations to parties. The front page of the site highlights a review of the day. Featured Yelpers also appear on the home page. It may sound corny, but such incentives are important to keeping people engaged. Most social systems have some sort of perk system, including ODP’s edit-alls and metas and the Wikipedia cabal. Although Yahoo’s design is more visually appealing than it used to be, it’s still cluttered. Unlike Yelp, the map scrolls off the search results page, making it hard to see where results 3-10 are located unless you have a very large screen. Getting reviews is more work than it should be. Yahoo! breaks its 69 reviews for The Italian Store across 29 pages, 3 at a time. Yelp shows all 42 of its reviews on one page, making it very easy to scan. I understand that local advertisers are scarce, especially outside the Bay Area. But Yelp takes the right approach. Disclosure: I used to work on local products for AOL. This entry was posted in advertising, city guides, local search, search, web 2, web 2.0, yahoo, yelp. Bookmark the permalink. You’re so right about the irrelevant adcrap on Yahoo. Something we’ve learned from Skirt! magazine is the overwhelming importance of the advertising in shaping brand perceptions. And in an infinitely competitive market, clarity of brand identity is infinitely important. Ads are, in a very real sense, part of the content. Hyperlocal content demands hyperlocal advertising. Don’t give me remnant crap … it undermines the brand.